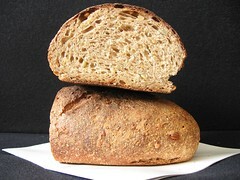 Sourdough Wheat Bread with Seeds - Do You Know The Muffin Man? Notes: I used the whole wheat starter I've been maintaining (roughly 85% hydration) and turned it into a stiff starter per her directions, adding half the weight in flour. Part of the directions say to knead at #4 on a KitchenAid but even my heavy mixer shook around on the table so I did the whole thing at the lower speed (the manual says to never knead dough higher than #2). To better fit my schedule, I did the second rise in the fridge for about 4 hours, then brought it back to room temperature in about three hours. The finished loaves were a little bitter, possibly from overbaking. The seeds are a nice addition but I might omit sesame the next time, I just don't care for them in bread. My starter is quite strong, as the sour taste is very pronounced. Not the best tasting loaf I've made.